In school, we learned about wars: which nations fought, why they fought, and who won and lost. However, there is another, more personal side to war: the experiences of individuals who served their nation, writing letters home to family and friends. 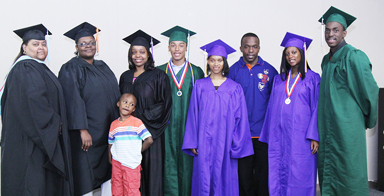 These letters depict their courage, devotion, honor, resilience, and faith. They reflect the very personal side of war, versus the dry statistics we learned in school. These are their voices and their stories. 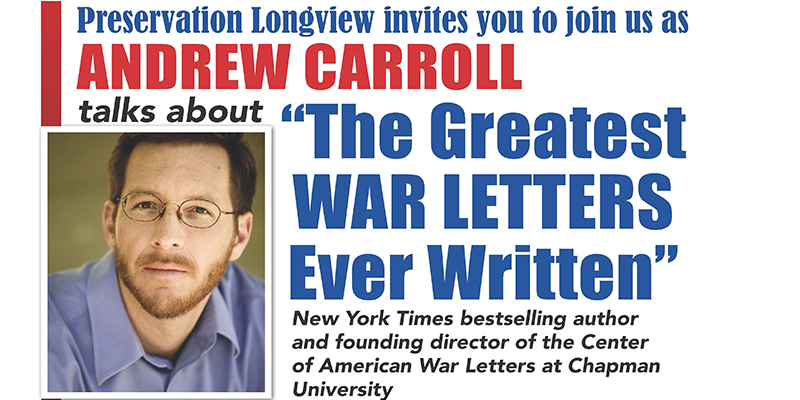 Andrew Carroll, New York Times bestselling author/editor, has made it his mission to preserve America’s “war letters.” In 1998 he founded the Legacy Project, since renamed the Center for American War Letters (CAWL), housed at Chapman University in Orange, California. Mr. Carroll has launched the “Million Letters Campaign” to find and preserve at least one million war-related correspondences from every conflict in U.S. history, from the American Revolution through the War on Terrorism. Mr. Carroll is the author of several New York Times bestsellers, including War Letters, Letters of a Nation, and Behind the Lines; he is also the editor of In Our Own Words and in 2017 authored and published My Fellow Soldiers – General John Pershing and the Americans Who Helped Win the Great War. 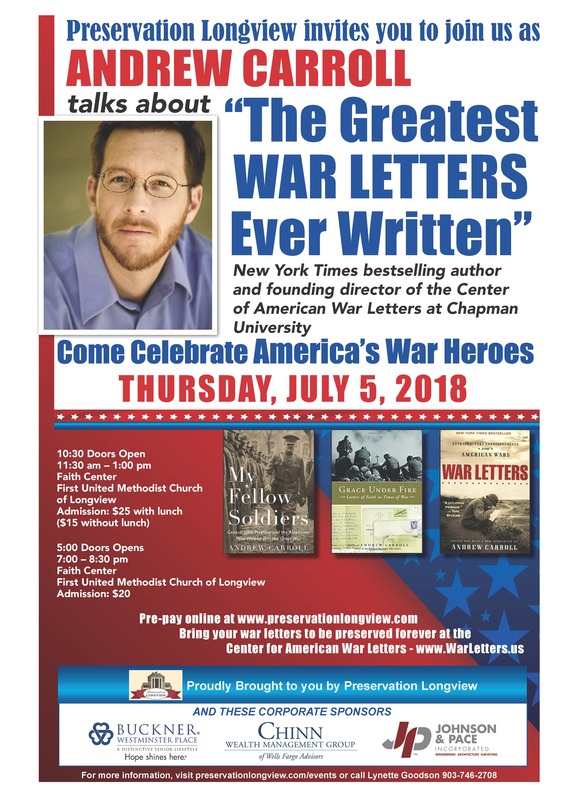 On July 5, 2018, Preservation Longview is bringing Mr. Carroll and his “Million Letters Campaign” to Longview, and the local organization is on a mission to help him collect and preserve war letters from East Texans. Copies or originals are acceptable, and individuals are urged to contact Ellen Gordon at 903-720-1398. 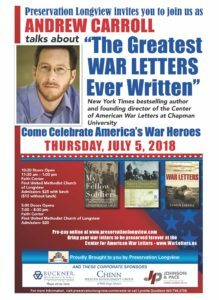 We believe that many area citizens will wish to meet and hear his presentation, “The Greatest War Letters Ever Written,” so we are offering two options: one mid-day, and one in the evening. An exhibit on war letters submitted by our own area citizens will also be on display in the foyer, along with some of Mr. Carroll’s books. 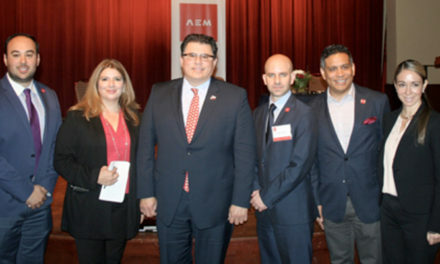 Andrew Carroll’s speaking engagements have included the U.S. Air Force Academy, the Pentagon, the Smithsonian National Postal Museum, the National WWI Museum & Memorial, the Harry Truman National Historic Site, the Pritzker Military Museum in Chicago, Columbia University, and Armed Forces Day in Boston. 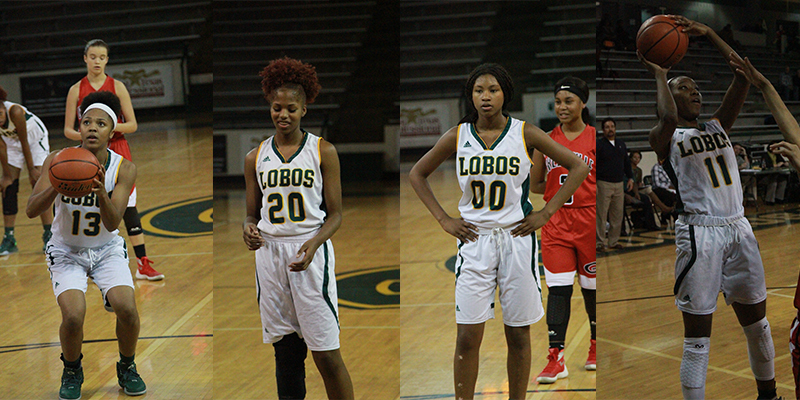 And now Longview, Texas!